The course of motor recovery after a stroke varies from patient to patient. The lack of agreed definitions and methodologies in stroke rehabilitation further complicate the course of recovery. Few standardized tests are available to accurately measure motor deficits after stroke. A physical therapist (PT) needs a reliable tool for assessing these changes. Furthermore, PTs need a way to visualize trending (progress over time) as it happens in the patient. Fugl-Meyer Assessment is a commonly used scale to do initial evaluation and also subsequent follow-ups. If a PT needs to assess only one of the domains, then subscales can be administered without the using the full test. Time to administer entire assessment is about 30 minutes. Although the score may vary depending on various factors such as type of stroke, the care team focuses on Minimally Clinically Important Difference (MCID). FMA Motor Scores from admission to discharge typically show a 10 point increase in extremities. Although validated and standardized, FMA is still a subjective test and the scores may vary from PT to PT depending on the experience of PT. How do we develop an objective criteria that supplements or validates information gathered from FMA? 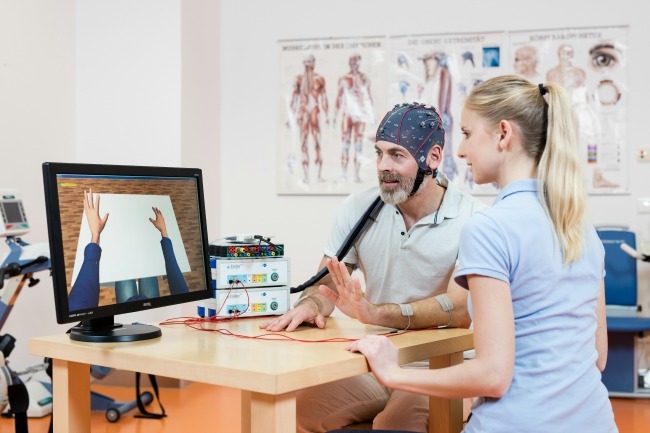 How do we automate the assessment of movement for post-stroke rehabilitation? In the recent past, several researchers have tried to solve this problem using motion capture systems. These systems can be expensive and medical community is looking for a low cost solution. Donald Heatherington, a Machine Vision and AI Engineer at BioVirtua, is ready to tackle this challenge. After receiving his Bachelor’s Degree in Mathematics from the University of California Santa Barbara, he has been a Full-Stack developer responsible for the design and creation of various IOT platforms. “My work at Biovirtua has been focused on collecting, visualizing, and analyzing volumetric patient data during clinical visits”. The volumetric patient data also provides objective criteria to support the FMA. He continues, “Our method of collection is noninvasive and does not interrupt clinical workflow while still being able to automate data entry for the clinician. From these recordings, we render a 3D model of the patient’s body and skeleton displaying limb range of motion and velocity. With the use of AR, VR, or a standard monitor, the clinician can view the patient in motion from every desired perspective and viewing angle without having the patient repeat the motion each time. The data we collect from these visits allow us to create valuable insights into that particular patient’s rehabilitation process. The quantitative data we collect is compared to prior visits with the patient and global patient population data to provide a detailed trajectory for the rehabilitation of acute care”.